Jonathan Bell has claimed a senior figure in the Executive Office was briefing against him as a "monster who had to be put to sleep" when he was a DUP minister. He made the claim to the RHI inquiry. He said the senior figure was David Gordon, who headed communications for the Executive Office in 2016. Mr Bell also alleged a journalist from a multi-national news company was briefing the DUP on how to discredit him by attacking his Christian faith. It is understood Mr Bell was referring to David Blevins, Ireland correspondent at Sky News. He told the inquiry it appeared to him that the journalist was advising the DUP on "how to discredit me and the information I'd given". A spokesperson for Sky News denied that allegation. "The suggestion by Jonathan Bell that David Blevins advised the DUP on anything is completely and utterly untrue," the spokesperson said. Mr Bell also claimed his former Special Adviser (Spad) Timothy Cairns was prepared to mould his story to "fit up" Mr Bell. He was speaking during his first day of evidence and referenced documents he had received from other inquiry witnesses. Mr Bell has previously claimed he was overruled by DUP advisers when he tried to close the RHI scheme. He added he could not operate against a Spad saying he would fit his story to the DUP narrative: "That is entirely fitting me up". Mr Bell was suspended by the DUP after he gave an interview to the BBC's Stephen Nolan in 2016, alleging he had been stopped by DUP advisers when he first attempted to close the scheme. Mr Bell told the inquiry that after he went public with those claims, he became the victim of a "massive smear campaign" by the DUP, and that his Spad was willing to say whatever he needed to say to fit in with the DUP narrative. He said he based that assertion on text messages and communications he had seen provided to him by the inquiry. The RHI panel has already heard how Mr Bell had a difficult relationship with his Spad, Timothy Cairns, after he became minister in May 2015. On Thursday, Mr Bell said Mr Cairns had "deliberately attempted to limit" his powers and that Mr Cairns had told him: "Ministers come and go, Spads remain." He claimed unelected special advisers had taken most of the decisions during devolution, and said he believed Timothy Cairns felt more responsible to the other special advisers in the DUP, Timothy Johnston and Richard Bullick, than to Mr Bell. 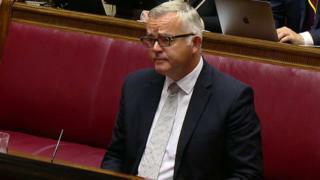 The inquiry asked Mr Bell about a row he had with Mr Cairns in a London restaurant in June 2015 over the extent to which Mr Bell was able, as minister, to take his own decisions without referring up to the wider DUP. Mr Bell claimed the conversation had nothing to do with RHI, and that he made clear he was the minister in charge and ultimately the one who would take decisions. Andrew McCormick said he had never seen a special adviser rebuke a minister like that before. In his witness statements, published on Wednesday, Mr Bell denied claims of bullying from Mr Cairns, or that he had tried to punch Mr Cairns and break his finger. On Thursday, Mr Bell told the RHI inquiry that the allegations were "untrue without foundation". He said he had never indicated or sought to indicate that he would "inflict physical violence on someone" and the claims had no basis in fact whatsoever. The inquiry has also heard more detail about how special advisers are appointed within the DUP - and how Mr Cairns came to the Enterprise Department as a DUP Spad. Mr Bell said when he became minister, he was not allowed to choose which adviser to bring with him. He said "it wasn't a choice" and that "there were many other people I would have chosen had it been left to me to do it". The inquiry chair, Sir Patrick Coghlin, said he had "real concern" about the procedure of adviser appointments being "camouflaged". Jonathan Bell was the minister at the Department of Enterprise, Trade and Investment (Deti) during the period that the RHI scheme did the most damage to the public purse. But it was after an explosive interview with the BBC's Stephen Nolan in which Mr Bell said he tried to close it down before that point, only to be thwarted by DUP advisers, that made the scandal headline news and helped lead to the collapse of the Stormont executive. Mr Bell was later suspended by the DUP, and stood as an independent candidate for Strangford in the assembly election in March 2017, but did not retain his seat. Read more of who's who in the RHI inquiry here. But Dr McCormick, the top civil servant in the Enterprise Department which ran RHI, said he had no evidence to support that contention. Later in Thursday's hearing, Mr Bell was pressed over how much he knew about delays in the introduction of cost controls in the summer 2015. It was during that period that civil servants were working on changes to the scheme after realising that it was running massively over its budget. The changes were outlined in a submission that was written for Mr Bell on 8 July, but he said he never received the submission and could not remember any discussion with Timothy Cairns about the submission when it was being drawn up. Mr Bell also said he was unaware of an email sent on 20 July from Arlene Foster's then-adviser Andrew Crawford, telling Mr Cairns that there would be a "massive spike in applications" before the changes came into effect in November. Mr Bell said he was "clear" that Mr Cairns never raised that point with him. On Thursday, Mr Bell also made other claims about culture in the DUP. They included allegations about sexual misbehaviour on the part of two former DUP ministers. However, the inquiry was quick to move on from this point of Mr Bell's evidence. In response, the DUP said: "It would not be appropriate to comment on evidence given to the public inquiry, outside of the inquiry process. It is important that the inquiry is allowed to complete its work." Mr Bell also addressed claims in his witness statements that in January 2016 there was a "major row" between the now head of the civil service David Sterling and Andrew Crawford over the scandal. He told the inquiry it had been Timothy Cairns, not him, who had "overheard" the conversation between the pair. He said: "He told me... David Sterling had shouted at Andrew Crawford: 'You kept this scheme open for the benefit of your family and you've caused a significant budgetary crisis in Northern Ireland." But the inquiry has also heard evidence that the conversation may not have actually involved David Sterling, but another civil service official instead. Mr Bell's witness statement also says that he was taking advice from former DUP leader Peter Robinson as the closure of the scheme was considered. Mr Bell will appear before the inquiry again on Friday to give more evidence.